“I would like to suggest another candidate that is really hard to beat and is fantastic value when you buy a used one – The Yaesu FT-817 Low Power Transceiver. It has outrageously good General Coverage performance and a massive LF – UHF coverage receiver. It has the same paperback footprint as many of the travel radios you review and a built in battery pack albeit a fairly low capacity one. Anil, you’re right. The FT-817 is a very compact, full-featured radio and certainly easy to pack. I was an early adopter of the ‘817, having purchased mine in 2000 or 2001. I was living in the UK at the time and traveled extensively throughout Europe for my employer. I looked to the FT-817 as a means to play ham radio on the go. It easily fit into my carry-on bag at the time. Like you, I was very pleased with the receiver though I had nothing to compare it to at the time. I kept the FT-817 for about five years, but eventually sold it. I started using the Elecraft KX1 as its replacement. I found that, for me, the ‘817’s front face was a little too small and some of the multi-function knobs could be a little frustrating to use while on the air. Those were relatively minor criticisms, though–the ‘817 continues to have a large fan base and is enjoying very long product life. Anil, many thanks for sharing your comment! 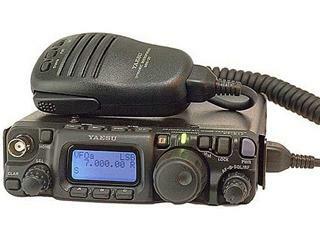 Click here to check out the Yaesu FT-817 at Universal Radio or click here to search eBay for a used one. This entry was posted in Ham Radio, Manufacturers, News, Radios, Shortwave Radio, Travel and tagged best radios for travel, FT-817, Shortwave Radio Travel, Shortwave Travel, Yaesu FT-817, Yaesu FT-817nd on April 28, 2014 by Thomas.